THIS WHOLE REVIEW DESCRIBES ME AND MY THOUGHTS ON THE BOOK OMG I LOVED IT SO MUCH. And honestly, Julian doesn’t get enough credit. Even if every credit of the world is given to him, IT STILL WON’T BE ENOUGH FOR HIM. HE’S A GENIUS. And mark! I want to call him a cinnamon roll but, it seems too casual? Common? Mark just made my heart go cartwheels in this book. I LOVED HIM AND HIS WAYS AND HIS CLUELESSNESS. The beginning when he gave Emma a fish? DEAD. RIGHT THERE. ALREADY. And I loved Ty SO MUCH MORE in this book than the last. Maybe because we got to see more of him. I remember the last because I was so shocked with what happened that I didn’t really believe I read right (it was 3am and my eyes were blurry as hell) so even though my heart was UTTERLY BROKEN, I went in and rereAD IT AGAIN, EFFECTIVELY SMASHING MY HEART INTO IRREPARABLE PIECES. I JUST COULDN’T ACCEPT THE ENDING. I knew we’d have a cliffhanger, but I thought maybe a couple or so things will go wrong. I expected something with Magnus because of the illness and some random thing related to the clave but NO. GO AHEAD AND BREAK ME. AND MAKE ME WANT TO GET BROKEN EVEN MORE. That;’s it. 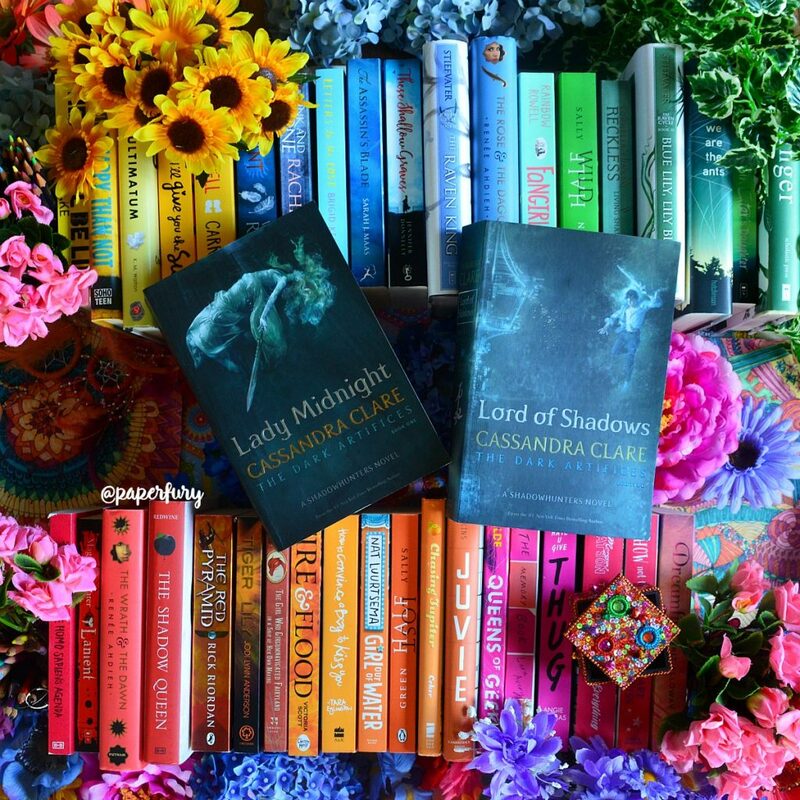 You’ve convinced me that I absolutely MUST read Cassandra Clare. Send some cake my way as I try not to end up an emotional mess. I gave up on the Shadowhunters a while back. I LOVED City of Bones, and City of Ashes was pretty good, but for me it kept going downhill. Never finished Infernal Devices, and probably won’t. (Just don’t have the time to wade through ALL THOSE PAGES.) Glad it’s still living up to your expectations, though. I did read Lady Midnight, so I am aware of all these characters/dramas that you address. And I did notice how Ty’s representation was very loving, and none of his family acted like he was “wrong” or “ill” or needed to be “fixed.” That was indeed beautiful. And it is kind of sad that Ty’s ASD is literally the only good loving fantasy rep I’ve seen…gahgugh. We must change this, Daley. I’m so glad I’m not the only one annoyed with Cristina.😂 SHE’S JUST GETTING IN THE WAY. I mean, she’s nice, but she also jumps to conclusions a lot so. I feel like Mark/Kieren won’t sail though because Mark is excellent at holding grudges. BUT CRISTINA IS SO WRONG FOR HIM. I’M SO MAD. YES I NEED TO CALM DOWN. I’M TOO INVESTED AND I’M DESTROYING MYSELF. “Don’t you forsooth me!” I AM DYING. I wasn’t able to read the rest of the post because OMG SPOILERS ARE FROM THE UNDERWORLD, but I am sure it was supremely clever. 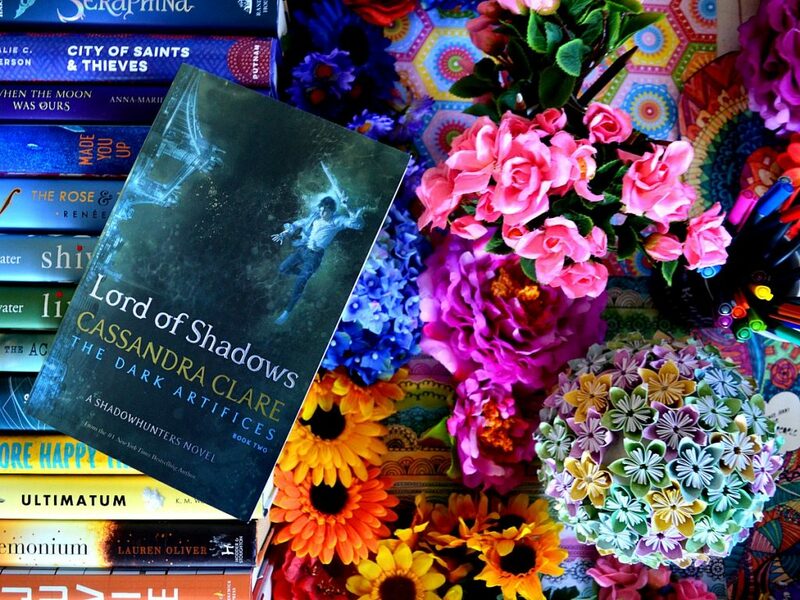 I need to read every single Cassandra Clare book ever ASAP. THAT IS FAIR! I don’t read reviews of sequels usually because it’s haaard. *weeps* But you do need to read all the Clare books. Like yesterday. I only really like the dark artifices and the infernal devices. I have tried multiple times to get into the Mortal Instruments, but I just can’t. I watched the movie and I was like, “Ummm…this is to crazy even for me.” Plus I don’t read many magical books set in today’s time. I wish there was more Mark, Cristina, and Kerian! Mostly Mark though (I feel weird saying this because my brother and my father are both named Mark. Oh well, I can’t help that they just happen to have the same name as one of my favorite characters). I love Mark and Cristina and if there was a book just about them, I wouldn’t complain. 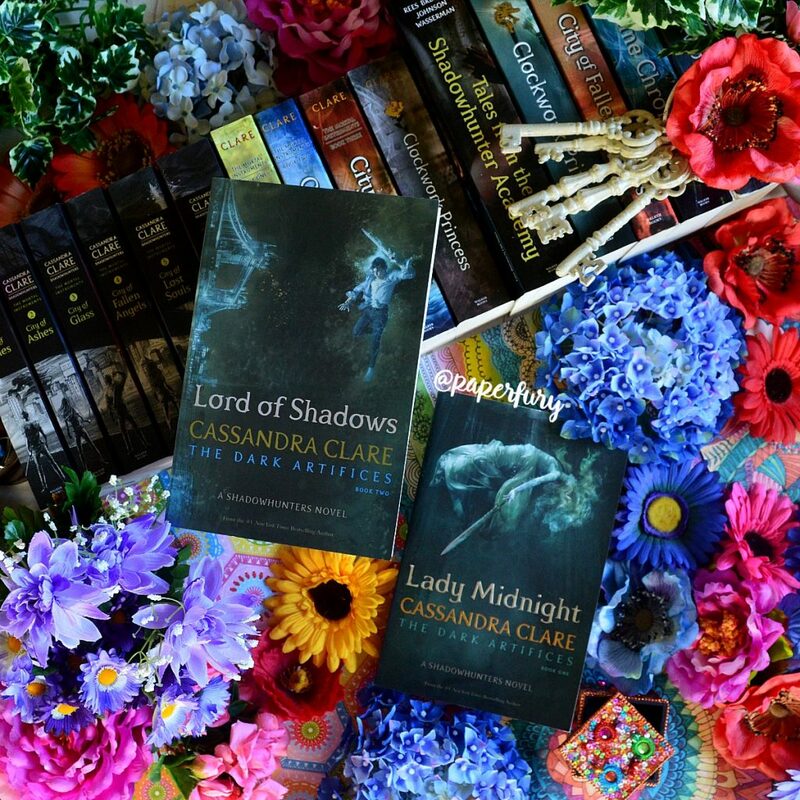 I think I liked Lady Midnight better though. There was just so much more suspense and mystery in Lady Midnight, and I loved it. Lord of Shadows was kind of like we all knew what was going to happen next. Also I didn’t like the ending with Livvy but I totally was betting Kit would die. I was like, “Oh, what if we went back down to one Herondale? !” Sadly my wishes were not fulfilled:'( I also got tired of Kit’s indecisiveness. I do love Ty too! He thinks outside the box, and he always seems to choose the most simple logical way. I also love that he doesn’t like to make people feel bad, like when Kit was like, “What if ‘Blackthorn blood’ means like a pint of blood?” And everyone looked at him like he was stupid and said “No.” But Ty was like, “I thought of that too.” I was laughing so hard!!!! But I also like how they would never react to Ty how they reacted to Kit, they are more patient with him. Also Gwyn and Diana! YES! YES! AND YES! Gwyn is so adorably awkward XD And when Diana confided in him, I was like, “Oh no, Diana! You can do whatever the heck you want!” Why is this shadowhunter council so close minded is my question?! LIKE WHY?! I say let Diana head the L.A. Institute! Someone needs to punch the Shadowhunter council, let's be real here. They're SO oppressive. *mutters to self* DANG THOSE BACK COVERS THAT DON’T ALWAYS SHOW THE BOOKS IN THE RIGHT ORDER. THEY DO. IT’S GLORIOUS. I WANT TO LIVE IN THE SHADOWHUNTER WORLD FOREVER. 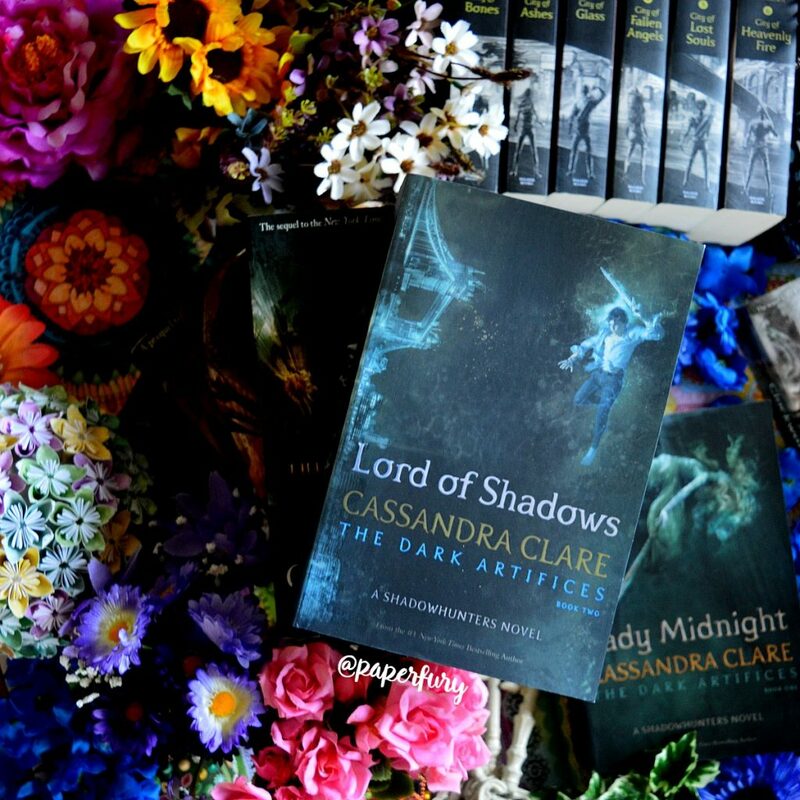 I literally shrieked when I saw that you posted a review for Lord of Shadows because it has been about 2 weeks since I read it and I am STILL HUNGOVER!!! 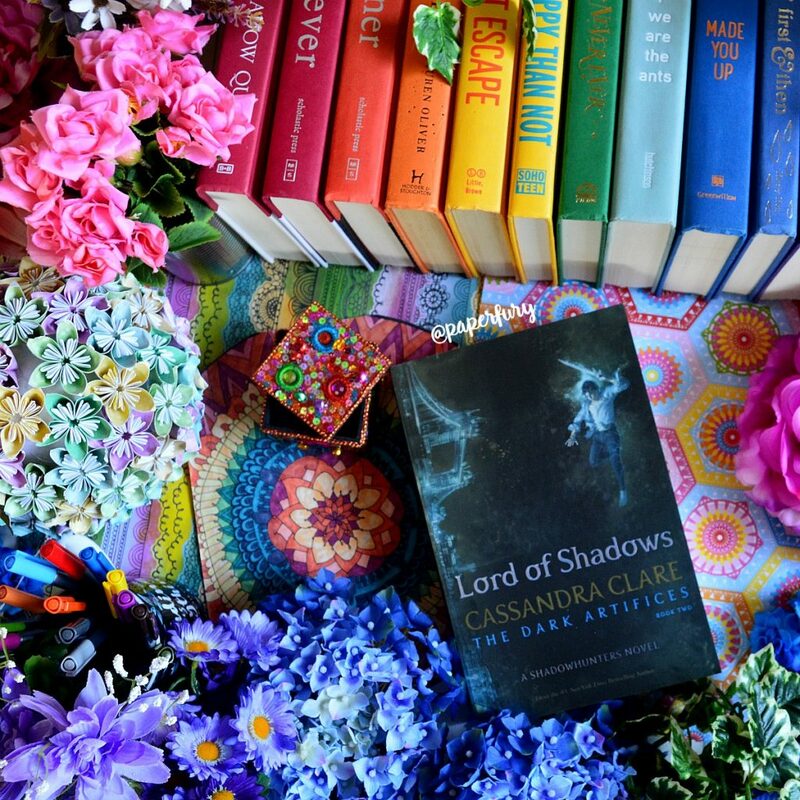 Cassie Clare really took things up a notch with The Dark Artifices and OMG LORD OF SHADOWS WAS JUST SO BEAUTIFUL!!!! 100% agree with everything you said and I also like how this book showed much more of the Fair Folk. AND THAT CLIFFHANGER!!! AND THE TWO-YEAR WAIT!!! WHYYYYYYY. SO MUCH HUNGOVER. I CAN’T EVEN WITH HOW HUNG OVER I AM. *sobs wildly* It was so beautiful and perfect and painful and perfect. You have just said everything that I feel. My review is hella long though ahah. So much to say about my loves. Am I the only one hoping for a Cristina/Mark/Kieran ship? Oh. Ok. I just think they’re all three beginning to fit, so at the very least they need to be friends. But I am kind of rooting for them being in a poly relationship. Also….waiting two years until we find out what happens to MB?! Why Cassie, why? Yeah….Julian was an amazing Slytherin in this book. But my favorite thing about him is the juxtaposition between his tenderness and ruthlessness, which I think we saw a lot of in this book. I loved the quotes you picked to highlight…reminds me why I love her writing so much. 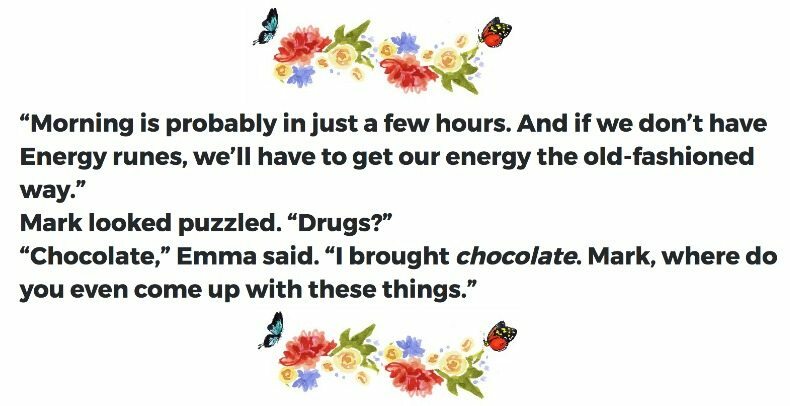 She really manages to evoke so many things in one book. Laughter, anger, sadness, fear, etc. Zara is really the worst, isn’t she? Ugh, and she’s so realistic, which makes it worse. What you said about Cristina being too good and boring…I kind of disagree. Like I see why, but I really like her. And I think that Cassie has done a good job writing her, but she’s not quite as vital as some of the others, though that seems to be changing. And we’re seeing that Cristina’s not perfect and calm all the time either, she just doesn’t explode like some of the other characters. I don’t think she’s as blindly favoring of fairies as she was at the beginning, either. Sorry, you are totally allowed to disagree with me, I just wanted to share my own perception. THe just sheer complexity of Julian gives me LIFE. He’s one of the best written characters!! Uhhhh! I should have NOT read this… but after your post title (“so good I lost my mind”) I had to read it! I’m still stuck on the mortal instruments and have to read heavenly fire. But I’am afraid what it will do to my mental health, so that I avoid to even buy it. 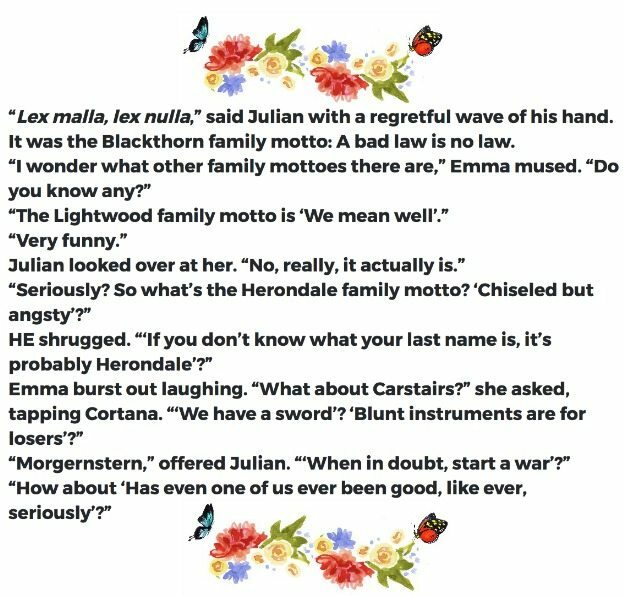 I have read her clockwork series and it is not my favorit, but this sounds really awsome, judging from the quotes and everything you said. Now I’am sure I have to keep a great distance between me and these poisonous books, if I don’t want to end in some mental asylum screaming about shadowhunters and how everything is so awsome. Thanks for the rescue, I guess! YOU NEED THEM. JUST TRUST ME. THE PAIN IS WORTH IT. I, however, have a hard time coping with unfinished series. I read TMI when #6 was not yet out… and had to wait FOREVER because I had 1-5 as paperbacks and had to wait AN EXTRA YEAR for #6 to be available in a matching paperback *because obviously I needed a matching set*. Anyway. For this ridiculous reason I have not yet dove into the Dark Artifices. But holy gamoly this review is giving me an anxious. It sounds like I am going to be all. about. this. I like TID better than TMI mostly because Clary causes me an annoyance. Magnus Bane is my over ruling favourite character of all of life. Him and Alec give me a happy. I am so pumped for all the plans Cassandra Clare has for the Shadowhunter world… though also a bit stressed? Because every time I read any book in that world I want to reread them all because it’s just such a fun place to escape to? And the more books the are the more life consuming this becomes? I have a conflicted feels. I’m actually glad I only got obsessed with Shadowhunters when I had the full first series.😂 I think I was reading while book 6 came out? So like I just got caught up and then got the last one. IT WAS NICE. Very convenient. I AM SO STRESSED TO. I AM SO SO STRESSED OMG CASSANDRA CLARE, YOU’RE HURTING ME. I’m too emotionally involved. I also loved the movie and wish they had stuck with those. That Clary wasn’t bad. TV show Clary is the WORST. I don’t think I’d pick Clary over Tessa… But I don’t really like Tessa much either. I am really not generally a big fan of female protagonists… I have very exacting standards on what makes me truly like a female lead. Too often they have too much going on for them and they induce eye rolling…. I like sassy side characters best. I have finally finished so I could read this. Unfortunately I spoiled myself with just 100 pages to go, so the ending was completely lost on me. It really spoiled my appreciation of the book (which is the subject of my post today). What I love about these books is the impossible relationships and the sense of longing the characters have. HELLO YES I WANT TO READ THIS ASAP. Although I barely remember what happened in the first one. BUT I KNOW THAT I LOVED IT. July TBR here I COME. I need he and Mark to end up together and that Cristina stop being ship with the both of them. I mean, I really think she would be an amazing friend for Kieran, but no way I see them have an actual romantic relationship. And you’re sooooooo right about her. She is sweet and good and kind but she’s just too good sometimes, and as much as I like her I also think she doesn’t love Mark the way he and Kieran love each other, it feels like she just have this attraction to him because she’s obsess with saving him, am I right? Ty & Kit give me life. The are perfect as individual characters as they are perfect together. I can’t wait to see more of their interactions. 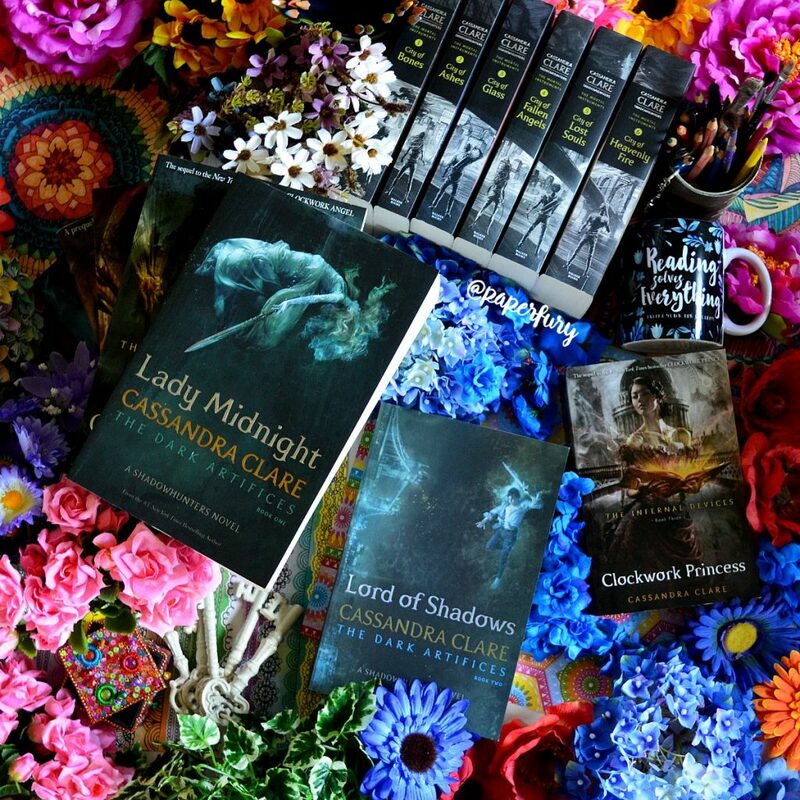 The reason why I love Cassie’s writing in the book and I like it a more than the first (although I love Lady Midnight so much) it’s because she just adds more and more diversity. As a Mexican fan I couldn’t be prouder of how well she represents the “chilanga” culture [“chilangos” is the way Mexican people who live in Mexico City are call] and the Spanish language. She actually ask someone to help her and she do it right. And let’s not forget about how well she represents Ty and his condition. She doesn’t jump to put things together, she builds them in a way that what the characters do have actual sense. Thank you so much for the review, shadowhunters give me life. THIS COMMENT MAKES ME SO SO HAPPY BECAUSE OU TOTALLY GET ME. THANK YOOOOOU. I AGREE WITH ALL OF THIS. It just annoys me so much about Cristina. I mean, like you said, she’s good!! We like her!! But she’s not right for Mark. Mark and Kieren needed each other and have history, but Cristina probably wouldn’t have even looked at Mark twice if he wasn’t fey. I just have a really bad feeling though because Mark/Kieren hate each other so much in LoS. 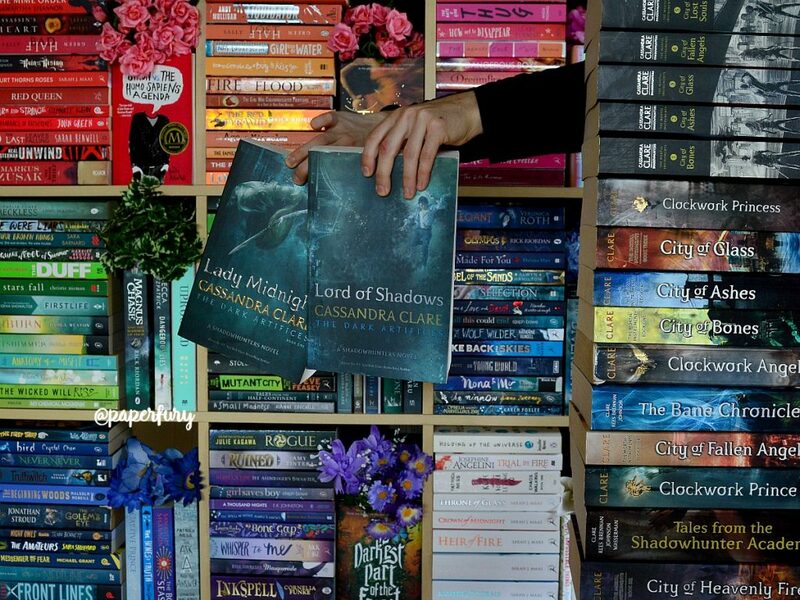 😭😭😭I want it to woooorok afjdklasdj PLEASE CASSANDRA CLARE, WE BEG OF YOU. And the diversity is so A+ I’m so impressed. :’) <3 Autism runs in my family so like Ty is SO accurate and well portrayed. It's exciting!! SO EXCITING. It's great to say "Hey minorities can be in awesome fantasy books too". So I'm super glad you experience that with the Mexican aspects too!! NOW WE JUST CRY AND WAIT FOR BOOK 3. I just finished Lord of Shadows 20 minutes ago and I think I’m not even really here. I have so many feelings and emotions about that ending right now, I don’t even know where to start processing them. Agggghhhh it was so soo sooo good!! GODS NOOOOO!!!! I finished this book today and i am officially dead! LIVVY? How could she? I ship Ty + Kit, Mark+ Christina, EMMA+JULIAN and so wish that perfect diego and zara to jump off a cliff. What did we do to wait for 2 goddamn years. HELP ME!!! ALL OF YOUR IDEAS AND OBSERVATIONS ARE SO ACCURATE! I’m definitely jumping on this series late, but I have loved every moment of it. I just finished the first book and was desperate to see what happened in the next book. Honestly, these facts just excite me for the rest of the series. 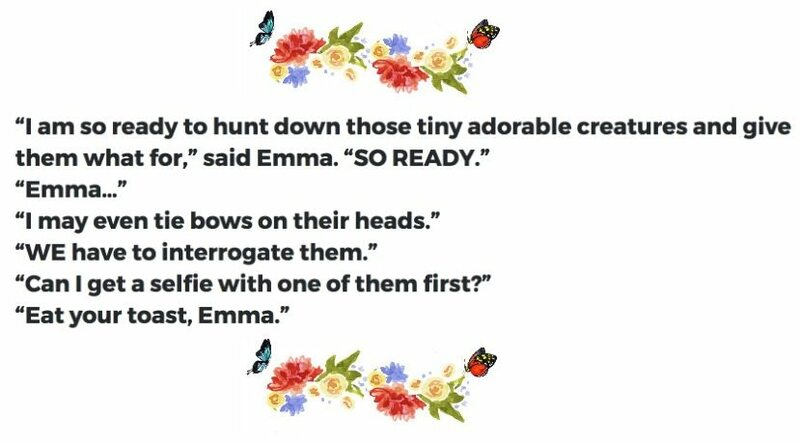 I adore Julian and Emma and I have to ask, do they end up together at the end of this or are we still left in suspense? All of this foreboding is crushing me! !